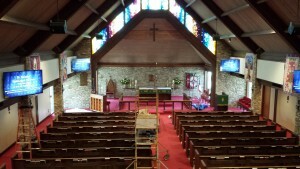 Austin, Texas – When St. George Episcopal Church in San Antonio, Texas wanted to improve the worship experience for its parishoners, integrator Multimedia Specialties recommended an upgrade to a flexible, affordable TEKVOX Multi-Display Solution. St. George Episcopal Church was founded in 1954 and holds two worship services Sunday morning. It had been using a projector and motorized screen in the altar area of its traditional church interior to display text and images, but the technology obscured the altar and had only limited multimedia applications. Multimedia Specialties installed four 65-inch LG LED screens on wall-mounted pivoting arms: two are positioned in the front of the sanctuary and two at the half-way mark in the congregation’s seating. Now, worshippers can enjoy more comfortable viewing of moving video and text that enhances the service taking place at the altar. ble. A unique feature in the TEK MHD44TP allows special embedded RS232 routing commands to be sent to any display or broadcast to all identical displays. Control of the system is provided using the TekTouchPad LCD virtual button panel. This single gang button controller allows for easy configuration of scripts assigned to buttons. TekTouchPad has a single RS232 output connected to the TEK MHD44TP matrix control port. For direct operation the TekTouchPad sends RS232 routing commands directly to displays via the TEK TPHD402PR HDBaseT receivers. The system’s ease of use was a key consideration in choosing the TEKVOX Multi-Display Solution. “The install was easy – virtually plug-and-play,” Joffe says. “Everything worked out of the box. The TekTouchPad was configured by TEKVOX so I just plugged it in. And the church staff tells me how easy it is to operate the system.” Staff can display content from PCs as well as any Blu-ray player with the new system.